Good ole boy Dickie Frye vanishes from the Georgia hills and the urbane Fletcher Carlyle bursts onto the New York publishing scene, winning the Nobel Prize for literature. But when a psychotic rampage lands Carlyle in Weatherhaven, eminent psychologist Anton Kohl finds himself talking to Dickie Frye. Kohl’s instincts tell him Frye is not lying—but what he says can’t possibly be true. A fallen priest comes out of Sumerian mythology, the love of Kohl’s life comes out of his past, and a chicken comes out of a posh apartment on Central Park West to meet his fate. Anton Kohl’s carefully constructed world is about to be deconstructed.One part fable and one part Southern yarn, Kiss of the Jewel Bird soars from ancient Mesopotamia to modern-day Manhattan, rewriting history and opening a window onto a wider, more magical world, where the path to destiny is anything but straight. 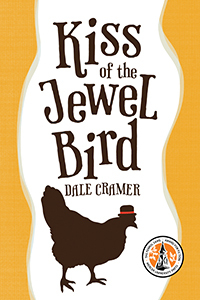 Dale Cramer has written many worthwhile novels in his career, but none of them has possessed the ridiculousness or the brilliance of Kiss of the Jewel Bird. This is a book that so stunned me with its apparent silliness that I had to read it twice, It was only on the second read through that I discovered the magic of the story and the heart of its characters. It was like digging through muck to find gold. The muck was all in my mind and I should have discovered the gold much sooner. The book concerns a southern good ole boy named Dickie Fry, who strangely wants to be a writer. Eventually he achieves success as the cultured and erudite Fletcher Carlyle, but not before he has a run in with a chicken. This chicken is either his mind's alter ego or an actual computer-typing fowl. You will have to make up you own mind as to which option you choose. What isn't up for debate is the richness of the characters Cramer creates. Dickie Frye is a fascinating study of talent captured within an uneducated mind. It is always there festering inside him but he can only release it when backed into a corner. This evolution of an artist is the heart and soul of Cramer's novel. Then there is Frye's psychiatrist Anton Kohl. This highly educated man comes burdened with psychological ticks and triggers. Only Dickie Frye can push through them and release the complete man Kohl ought to be. He also frees Kohl up to the possibility of finding his true love, a relationship he has avoided for years. There are lines, phrases and thoughts placed in this story that are nothing short of brilliant. Cramer shows his own creative gifts by erecting a magnificent structure or a house of cards. He provides credibility to either scenario. To totally enjoy Kiss of the Jewel Bird, you must open your mind to all possibilities, and you must let your imagination soar. If you do this then the golden wealth of his words will unfold before your eyes and provide you with a literary experience unlike any you have had in some time. KISS OF THE JEWEL BIRD is more than just a cautionary tale about being careful what you wish for. It's a brilliantly funny, insightful, and touching tale about humanity and facing your fears. The characters are carefully drawn and fully formed; the story will keep you riveted--and leave you believing that the universe is a lot bigger than you thought. Cramer is an extremely gifted writer, and I look forward to reading everything he writes.